Whenever life shifts, when it changes and creates what may appear to be discord in our lives, feeling the discord then letting it go helps ease our suffering and allows the resistance to soften so we may continue on our path…when we can pick up the pieces of whatever’s broken we have an opportunity to create something more beautiful and life vivifying than what came before. Here’s to picking up the pieces and creating a work of art! Faith is the soul’s knowing that what hasn’t yet been experienced is a possibility. I have some experience with the challenges around this topic. My inclination had always been to put others’ needs first before mine, to minimize my needs so as to accommodate others. While that is absolutely necessary in life, a balance needs to be created between dispensing our energy and energizing ourselves. We need to get in order to give. How do we replenish ourselves of the energy we give away? Through loving ourselves. That’s it. The love we give away must be equal to the love we show ourselves. Otherwise, we end up depleted and defeated. The challenge here is that often we hold the belief we don’t deserve it. For some reason, we don’t feel as worthy of receiving as those who receive. As we live our lives, we often lose touch with the loving, divine beings we are. We are made up of pure love. The energy that fuels us is love energy. That love energy is what makes up the universe. That universal energy is flowing through us and is everywhere, all the time. It’s an unbroken cycle. If we lack the love for ourselves that we endeavor to give away, we disconnect from that universal love. We temporarily break and disconnect from our source. Without source energy flowing through us, we deplete our own. We cannot give what we don’t have. So if we truly want to share with and serve others with our love, we must connect and replenish with the love of the universe. Make sense? Let me know your thoughts! These words confuse me a little. We call no longer living death. We call death the after life. But, what is death, really? In my experience, death is the transition from the physical form in this 3-D world to a less dense existence in the “spiritual” realm. We are still “alive” though, just in a different space with a different awareness. What I learned in my “afterlife” was we get to choose our awarenesses, everywhere, all the time. Whether in physical form or spiritual form, we choose. Based on our choices, we create and co-create our experiences. Death is not the end, it is a transition. It is a transition of consciousness from one awareness to another. It’s a shift from here, to there. A movement from life to life. This picture was taken in the Bahamas a few years ago. 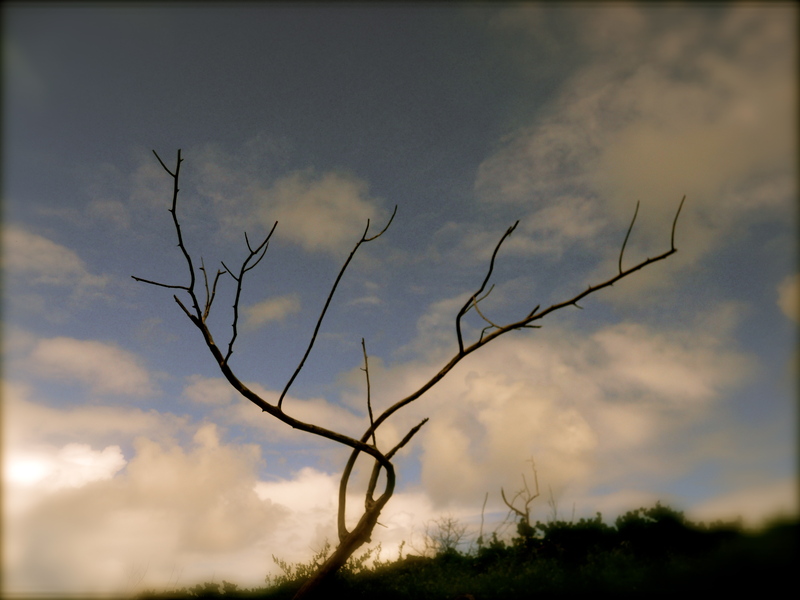 I loved the tangled beauty of the branches that seemed to reach out to the sky like fingers ready to grasp the unknown. It means to have the knowledge that you and everything contained in all there is are one. There is no separation between you, me, nature, the stars, and so on. All of it is the collective “We”. We are, I am, the Alpha and the Omega. With this awareness, there is no separation from anyone or anything. When the “I” becomes “We”, our entire world takes on new meaning. There is a shift in perception that re-creates the bond with the infinite divine that was fully present in our awareness before birth, and is challenged in the face of the duality of this world, only to be fully present once again through re-experiencing our true nature. We may have this experience here, in our body, if we choose to. In our physical and nonphysical form we have, and always have, free will. My experience in both near death and this life on earth is that we are seamless forms of consciousness, only here we are not always aware this is so. How do we cultivate awareness? First, by acknowledging the possibility that what we see isn’t all there is. What we experience in physical form is only one part of the story, and no matter which part we experience, it is just as important as another. There are no exceptions, but, we always have free will to choose what kind of experience we have. We have the ability to change our reality at any moment in time. Being that it’s New Year’s Eve, I, like so many, find myself looking back at this time last year and being really amazed at the huge transformations that have happened not only in my life, but in the lives of my family. For me, it’s been a journey of opening up and being vulnerable. I am allowing myself to “become” and show others my authentic self. My NDE reminded me of who that is, and of the spiritual commitment I made during my journey into the afterlife, which was to share the love I am with the world. This happens in myriad ways, and at present my ADD mind is trying to organize my efforts in many directions (M-A-N-Y). Lol. What happens in the coming year depends on me. I create my life from my intentions, and so far, they’ve always delivered. Maybe not in the exact way I wanted them to, but always for the higher good of everyone involved. When something doesn’t “go my way” it’s for a pretty darn good reason, and just means there is something better coming down the pike than I could have imagined . When these good things happen, it’s not just me that benefits, and that’s what life is all about. Death is not the end, but rather a natural continuum of life. Life eases into death, where we undergo the necessary preparations to ease back into life again. This completes the circle, one that is only to be repeated when we are ready to do so. Our existence is defined by these cycles of life and death, and each one has the potential to further us along on our evolutionary spiritual journey, one that ultimately leads to the Great Unknown.